Aurelia, or Moon Jellies, by the reefs off Lizard Island, Australia. Photo by Chris Meyer. Scyphozoans include most of the jellyfish familiar to beach-goers; other similar organisms are classified in the Hydrozoa and Cubozoa, two other groups of cnidarians. True jellyfish are graceful, and sometimes deadly creatures. Their stings may cause skin rashes, muscle cramps, or even death. 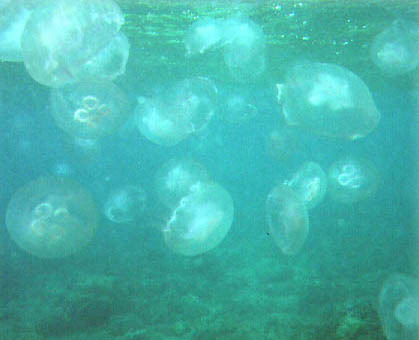 Jellyfish range in size from a mere twelve millimeters to more than two meters across. The largest is Cyanea arctica, which may have tentacles over 40 meters long! Despite their often enormous size, jellyfish have no head, no skeleton, and no special organs for respiration or excretion. Their life cycle involves an alternation between sesslie polyp phase and a free-swimming medusa stage, though the medusa stage, shown in the picture above, usually predominates. Jellyfish are not terribly important as a food source, though they are eaten in some countries. In northern waters, large shoals several kilometers long sometimes hamper fishing by clogging nets. Click on the buttons below to learn more about the Scyphozoa. Check out the Monterey Bay Aquarium or browse the lists on the Cnidaria Home Page. A movie of a live, swimming scyphozoan, Cassiopaea, is now available in either MPEG or QuickTime format.